In 1884 when Charles Dow was composing his first stock index it contained a grand total of nine railroad stocks plus three industrials. Four years later the number of railroad stocks had swelled to 18, and would eventually go on to become the Dow Transportation Index. It might seem odd that railroad companies would take up 75% of what was ultimately a precursor to the Dow Jones Industrial Average, but the fact was that railways were the US economy in the late nineteenth and early twentieth century. 12.50% of the entire market capitalization of the New York Stock Exchange came from railroad stocks in 1929. Today it’s a minuscule fraction of that amount. What I like about the railroad stocks is they offer long-term investors the perfect case study in market returns. Between 1950 and 2000 the railroads’ share of the industrial sector declined from 20% to 5%, yet the railroad stocks still handily outperformed both the industrial sector and S&P 500 over that fifty year period. What was the key to railways outperformance? Years of relatively low valuation, brought on by fears over the health of the industry and an under appreciation of growth prospects. In the 1950s as a railroad investor you were facing the double threat of an expanding highway network and the introduction of commercial airlines. The expanding highway infrastructure beefed up competition from the trucking industry as well as lessening the need for rail passenger services; the airlines of course ended up taking a huge chunk of long-haul commercial passengers. That double threat, plus heavy government regulation, ultimately culminated in a series of bankruptcies that hit northeastern railroad companies in the 1970’s. In 1968 two of the biggest railroad companies – Pennsylvania Railroad and New York Central – had merged partly as a response to the threats outlined above. Now, these had been unbelievably stodgy blue chip stocks: New York Central was an original member of Charles Dow’s 1884 index whilst Pennsylvania had paid out dividends for over 100 consecutive years going back to the 1860’s. They both survived the Great Depression – with Pennsylvania even maintaining positive earnings-per-share between 1929 and 1933. It would have been unthinkable for much of that time that stocks like Pennsylvania could end up on the scrap heap. In the end the short-haul nature of the Northern Eastern railroads meant that competition from the newly created Interstate Highway System was having a significant impact on profitability. In addition the company had also been taking on a heavy amount of debt to keep up its dividend record. The end result was the largest bankruptcy in US history at the time and a century of unbroken blue chip dividends resigned to the dustbin of corporate history. In total six of the big northeastern railroads went bankrupt in the late 1960’s and 1970’s. As you can imagine this hit the railroad industry hard – right across the board. It didn’t matter whether your railroad stock was largely in the long-haul game, not quite exposed to the same level of risk that had contributed to the northeastern bankruptcies. Railways were a dying industry and investor expectation hit rock bottom. In a way it’s kind of similar to the tobacco industry. The level of expectation in those stocks was sucked right out when it became apparent that health risks were an existential threat to their business models. In a kind of perverse irony the threat of mass litigation and fears that consumers would dump their cigarette habits en masse contributed to the enormous wealth creation that tobacco investors subsequently enjoyed. The same happened to the railroad stocks. Crushingly low investor expectations contributed to the outperformance of a slowly declining industry. In the years following the northeastern bankruptcies government regulation had been greatly eased alongside a period of consolidation among railroad companies. Productivity was increasing and profitability metrics remained quite attractive in many of the majors. Let’s look at the more recent histories of two of the biggest railroad stocks: Burlington Northern Sante-Fe and Union Pacific. Twenty years ago a potential investor would’ve been looking at Burlington Northern Sante-Fe trading at 14x its 1996 earnings and Union Pacific trading at 16x its 1996 earnings. Now, over a long-term horizon those starting valuations look pretty attractive. This is a full twenty-five years after the industry turmoil too. As an aside you would also have been looking at respective dividend yields of 1.5% (BNSF) and 2.7% (Union Pacific), which in both cases are covered quite healthily by net income. Over the following years Burlington Northern Sante-Fe increases net earnings per share at a compounded rate of 8.8% per year until it gets taken over by Berkshire Hathaway in early 2010; Union Pacific does so at a rate of 9.10% per year up to the present day. What about in terms of share holder returns? On a $10,000 investment in each stock you would have generated the following: $36,500 worth of Burlington Northern Sante-Fe stock before being taken over by Berkshire in 2010 and $57,500 worth of Union Pacific stock. In addition you would have received approximately $3,765 in BNSF dividends before the Berkshire takeover and $8,050 in Union Pacific dividends. That’s a combined total return of $105,815 on a $20,000 investment, and doesn’t include the additional boost to returns you would have seen by reinvesting the dividends into more stock. So to sum up, our investor saw compounded annual returns of 11.30% in Burlington Northern Santa-Fe between 1996 and 2010, and 9.70% compounded annual returns in Union Pacific between 1996 and 2016. Actually if anything this masks the true level of returns. 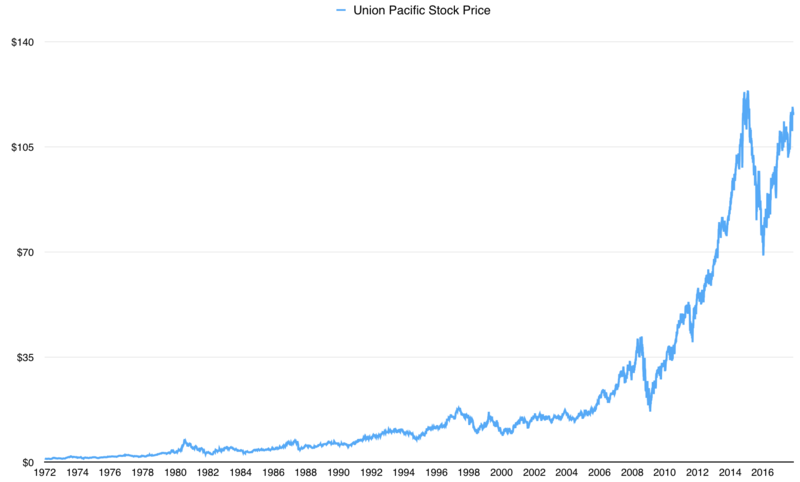 Union Pacific has compounded its share price alone at a rate of 9.5% per year since 1978, excluding dividends. What about some other railroad stocks? Well, Norfolk Southern has delivered compounded share price gains of 9.1% a year since 1982: $1,000 invested back then would be worth $19,500 today, not including the thousands paid out in dividends over that period. Kansas City Southern has turned a $1,000 investment in 1996 into a mind boggling $100,000 today. It’s phenomenal wealth creation in an industry that has seen nothing but a declining share of the US economy. So, if you have to take one key lesson away from the experience of railroad investors it’s this: lower value equals higher expected returns, whether that be in growth sectors like technology and finance or declining industries like the railroads. That’s the key to long-term investing.